This was late Friday afternoon, June 27, 2008. With the sun beginning to set behind the steep hills of the Thunder Valley Motocross Park in Lakewood, Colorado, Cody Cooper, a privateer of the highest order, was standing outside the cramped and busy Suzuki City/OTSFF Rockstar team trailer. In the weeks to come, Cooper did in fact start “doing it” as by the second moto at Red Bud in July (in which he placed sixth), the New Zealander began stringing together a series of top-five moto finishes, the foremost coming in the second moto at Unadilla where Cooper came up just short of actually breaking James Stewart’s win streak. 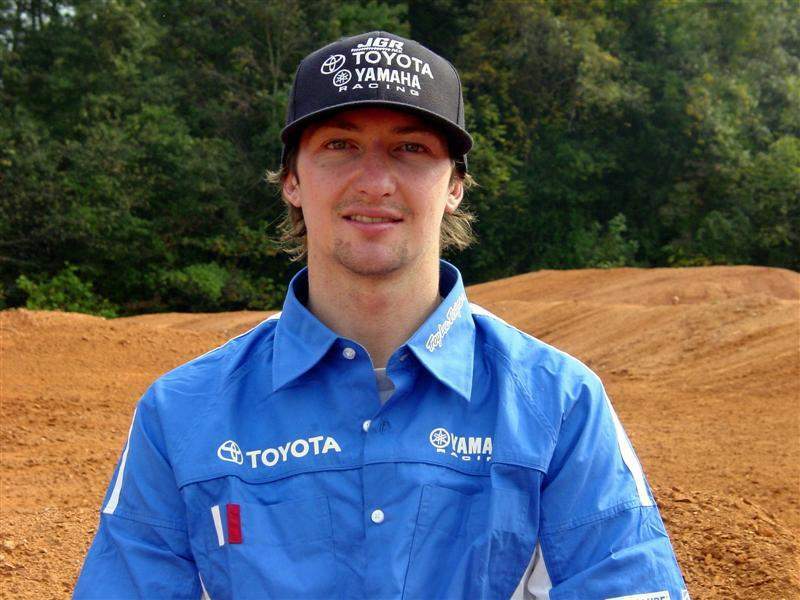 When the curtain dropped on the 2008 AMA Toyota Motocross Championship Series at Steel City on August 31, Cooper found himself fifth overall in points. The soft-spoken 24-year-old was duly rewarded with a plum ride, signed to the upstart and well heeled Joe Gibbs Racing organization to compete in 2009. To find out more about his new lot in American motocross life, we looked to North Carolina and upon doing so, hooked up with Cooper who had just finished up a hard day of riding. Racer X: Hey Cody, how are things in North Carolina? Cody Cooper: Yeah, I’m just mucking around here and just doing a bit of riding, I suppose. Actually, I’m doing more testing than riding. How long have you been in North Carolina? I’ve been here three weeks now. It’s been good, though — but it’s quite cold. I’ve been riding on the Yamaha for about three weeks now. Every day that I’ve been riding, it’s had something to do with testing. We’ve been getting the bike pretty good. And then in the first week, we’ll be coming out to do some testing in California. Yeah, yeah, well we have to do a race on the first weekend of December in Switzerland (the Geneva Supercross on December 5) and then the weekend after we’ll be doing the X Games in Dubai (on December 12). Yeah, I suppose it’ll be good for me to get some actual racing under my belt before I go to the supercross. Otherwise, it would be a big step for me to just turn up and race Anaheim I. As a lot of people may not know, you don’t exactly have a tremendous amount of supercross experience, right? No, not very much at all. How do you feel on the Gibbs’ test track and how do you like your motorcycle thus far? Well, I’ve been riding more supercross than I ever have, so that’s helping a lot. And the first day I got on the Yamaha, I felt pretty good. It was easy to do the testing and stuff right away because of the way the bike was set up. The guys did a good job setting it up and it made my job a lot easier, I suppose. From knowing a lot about the bike and them helping me a lot has been great as I have not done a lot of supercross testing. It’s hard for me to know what is good in supercross because I have not done a lot of testing for it, so it’s definitely been a learning curve for me. If it was motocross, it would be a lot easier to pick out the main things because I know what a good handling bike is. I know what direction to go in motocross, but supercross is a little bit different so at least I’ve got all the good guys to help me and point me in the right direction. How do you feel about the team so far? Do you have a good feeling about everything? Oh yeah, real good. I like it out here. Everyone lives here and every day you get to see everyone. It’s sort of like my family here, you know? I hang out with all of them every day and do stuff. It’s pretty fun instead of just finishing your training for the day and then going home and not doing much, you get to hang out and do stuff afterwards. It’s pretty cool. I’m really liking it up here so far. Yeah, I was living with Ben [Townley] and he helped me out a lot, but he was injured as well, so I didn’t have that many people to ride with. There was Ivan Tedesco out there riding with me and that was good, but to go cycling or to go to the gym, I’d go do it by myself. It was a bit hard like that. When you have someone else there you give that extra 10 percent and that’s what helps, I suppose. It’s definitely easier here. The guys are not just here to set your bike and stuff like that, but they’re behind me even when I’m trying and cycling and stuff like that. It’s pretty good to have them do that for me as well. How did you end up riding for Joe Gibbs Racing? [Business Manager] J.H. Leale helped me last year and he’s helping me this year. He talked to them before the motocross season this year and tried to do some stuff, but I ended up doing the Suzuki deal because I had already sorted out something with them. This year I planned on doing supercross and motocross, so J.H. talked to the Yamaha team and it just turned out like this. J.H. knows a lot of people and knew Jeremy [Albrecht] quite well and it just went from there. I think they know for my first year in supercross, they’re pretty cool with me not performing to a level, say, as [teammate] Josh Grant would. I’m real happy how they went about that. That’s pretty cool. I think they’re looking more at my motocross skills, but I feel like I’m picking up supercross pretty fast. Speaking of motocross, in the second moto at Unadilla, not only did you run second to James Stewart, your lap times were right there with James. After that moto, did people begin to take more notice of you? I’d say a little bit, yeah, for sure. But being out in the back of the pits, it didn’t change much because I didn’t really get to see many people. But the result made me realize that I could actually do it. So I put extra hard work in and it paid off. Yeah, that was real unexpected from me. I was real buggered, though. It was a hard track to ride on. I was really tired after the first moto because I wasn’t standing up enough and I let the bike beat me up. Before that second moto, I was thinking, “How am I going to get through this?” I sort of told myself that I would and I just got a good start and just went from there. I ended up getting second, so it was pretty cool. Then you went over to Donington, England for the Motocross of Nations and won the Open Class qualifying moto and holeshot Sunday’s MX2/Open moto. All and all, a good experience for you? Oh, for sure. It was real good for me. I was real happy. I got two holeshots out of three motos and that helped out a lot. What are your goals for your first supercross season in America? I know roughly what I want to do. I’d really like to finish probably top 10, but it’s hard for me to say what I want until I suppose I go and do these races in Europe and stuff. I’ll make some proper goals for myself after that. Cody, you essentially came off the beaten path to make it here in American racing and really earned the opportunity you’ve been given with Gibbs Racing. Are you surprised the way it’s all turned out for you? I’m a little bit surprised. I didn’t expect to get this far. It’s been good. Since I’ve been a kid, it’s been my dream to ride on a factory team and I’ve pretty much got there, I suppose. I was thinking about it the other day and it’s pretty cool. I’m pretty happy with what I’ve achieved. Now I can make some bigger, long-term goals and work for them. I’m pumped. It’s pretty cool for me, for sure. Cool. Thanks for the call, Eric. I really appreciate it.